What happens at a music vigil? The intention of the music vigil is that it offers a soothing presence to support the emotional, spiritual and physical needs of the patient. The trained music-thanatologist watches with a peaceful, attentive presence, and offers supportive assistance as required through the use of live music (voice and harp). This music is continually adjusted in the moment to support the complex changing needs of the patient. The cultivation of a comforting silence is an essential ingredient in the vigil also. This cultivation of a loving presence along with skillfully played, supportive music, and the development of a comforting silence most often brings profound peace. Family members, loved ones and carers may benefit also. What is required of the patient? 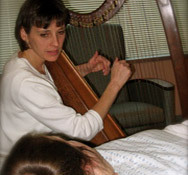 This music is a unique form of comfort for those facing life threatening illness and at the very end of life when death is imminent.The patient is not required to respond in any way, instead an invitation to "rest into the music" is offered in order that they need not expend any energy making new connections. How can I request a music vigil?